Use the Google Sheets Add-on to add data from Google, Bing, Facebook, LinkedIn, Twitter, and Gemini to any Google Sheet. Getting started is easy, all you need is an AdStage trial or paid account. Once you've connected your ad accounts to AdStage you'll be able to pipe data into Google Sheets. 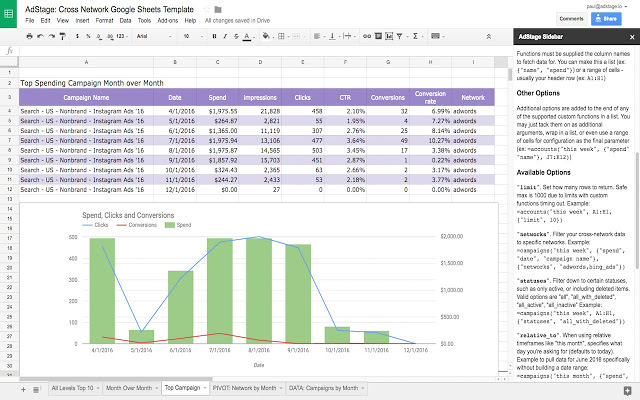 You can bring your paid search and social data into Google Sheets by writing simple formulas. These formulas pull from our metric system through our Universal Data API. More on how to setup formulas and the Google Sheet Add-on here. What are some common ways to use the Google Sheet Add-on? Compare Data from Multiple Networks: Get your PPC performance data from Google Adwords, Facebook Ads, Bing Ads, Twitter Ads, LinkedIn Ads, and Gemini. See cross network SEM data in a single table or chart. Multitude of Metrics: Pull in information about your ad campaigns like Campaign Type, Status, and Campaign, Ad Group and Ad Id. See all available options here. Bring Your Favorite AdStage Views to Sheets: Customize your reporting views with performance data organized by AdStage Account Groups or Folders. Share your Data: Give others access to your reports & dashboards. Have questions about getting started with the Google Sheets Add-on? Feel free to reach out to us at support@adstage.io.